Fact: Approximately 90% of all adult women suffer to some extent from cottage cheese thighs, orange-peel skin or good old cellulite. Because everyone is different, certain treatments and remedies will work well for some, while others may experience some trial and error before they find the cellulite reduction solution that works best. Cellulite remedies come in a variety of forms ranging from free to quite expensive and everything in between. Some treatments are considered by some to be drastic, while others are considered merely part of a daily routine or even good general health. This guide is designed to give you some basic tips and information as you begin your journey to reduce or eliminate cellulite. Rest assured, there is a cellulite reduction strategy that is perfect for YOU! This tip is important for a variety of reasons. Aside from the issue of cellulite, water is healthy and absolutely essential to good health. By drinking at least 8 glasses a day, your body is in a better position to function well, lose excess weight if needed and keep your skin fully hydrated. Hydrated skin will show less cellulite. If you are overweight, losing weight specifically from fat will definitely decrease and in some cases eliminate the cellulite you are carrying. In fact, proper diet and exercise should be the first steps in attacking cellulite. Losing fat is accomplished by achieving the proper balance between diet and exercise. Dieting for fat loss – Diet does not mean starvation. Diet means eating the right foods in both the correct quantities and at the appropriate time intervals. Many dieters make the mistake of not eating enough. Nutritious foods including lean proteins, fruits, vegetables and whole grains should be eaten over the course of 5 or 6 small meals each day. Building or maintaining muscle and burning fat - Weight or resistance training is essential to having a lean body. While most female exercisers concentrate on cardiovascular activities, they typically do not get enough (if any) muscle resistance activity. This is a big mistake. Getting the proper types of training can dramatically improve a cellulite condition. Use exceptional moisturizing creams and lotions. Although any moisturizing lotion or cream will improve your skin’s texture, quality along with price does vary. Products designed specifically for treating cellulite work better than your everyday hand creams. The best ones will improve circulation and encourage the production of collagen in the skin. Of course for the best results you will need to use on a regular basis. Look for highly recommended lines and if the first one you try doesn’t do the trick, keep shopping for something that does. Will a cream or lotion be enough? That all depends. For those who are at a normal weight with little to no excess fat, a good cellulite cream may be all that is needed to remove those unsightly lumps and bumps. Just remember to use the product on a regular basis and give it a good six to eight weeks to produce the best results. For those with excess weight to lose, it will be more cost effective and beneficial to focus on reducing overall body fat through a healthy diet and exercise plan first. Endermologie, laser treatments and liposuction…oh my! Can these options cure your cellulite problems? Maybe. Endermologie is the least drastic of the three options and is thought by some to work the best. The drawbacks include the expense and the need for follow up treatments. Without regular treatments the results will likely not last. Laser treatments have the potential of longer lasting results but again, they are not a sure thing. Liposuction is an invasive option and may help reduce cellulite but is not guaranteed to eliminate it. These options are among the most serious and should be given thorough consideration before making a final decision. Treat yourself with a body wrap. For the ultimate spa luxury, get a professional wrap. Not only will you improve the look of your cellulite covered areas, you’ll get a truly relaxing experience away from it all. As with other options, the results will not be permanent but at least you’ll have an excuse to go to the spa every so often! An alternative to the high cost of spa treatments is an at home body wrap. Several products are available for home use that can be quite effective. For a fraction of the cost you can have a comparable spa experience in the comfort of your own home. Try a few different options to find the one that works for you. Consider using a self-tanning product in addition to one or more of the above ideas. Tanned skin will make existing cellulite less visible. Self-tanning products are superior to the real thing due to the dangers associated with tanning as well as the drying impact it has on the skin. Remember, moisturized skin is important for cellulite reduction. 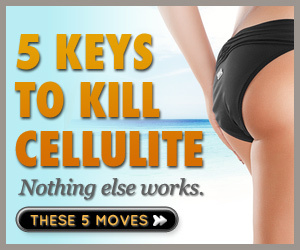 Well, there you have it… a group of possibilities for reducing cellulite. Keep in mind through this process that you are not alone… the majority of us have some cellulite on our bodies. It is important to do everything you can to look your best, but be kind to yourself and do not expect perfection. If you can find a product that works well enough to dramatically improve the look of your skin, you will have been successful in your cellulite reduction mission.